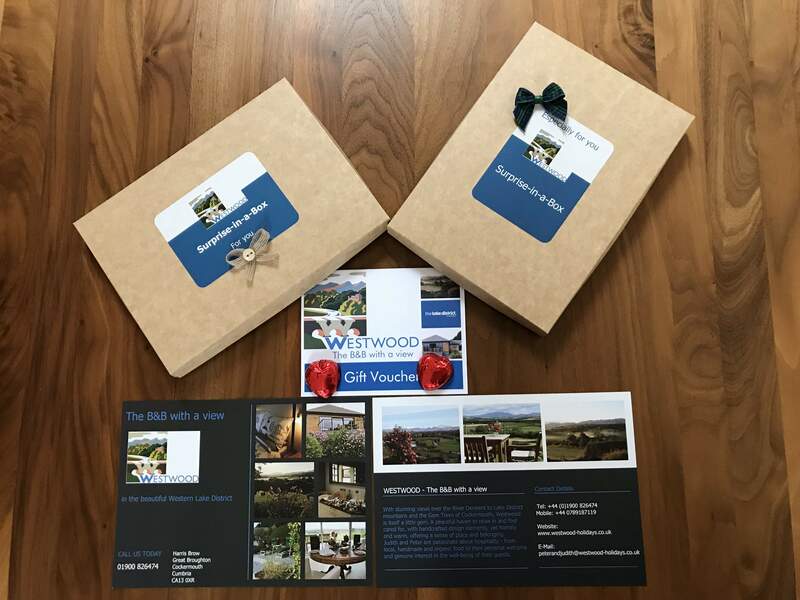 We are delighted to offer our new "Suprise-in-a-Box" so you can give someone you love a relaxing stay in the beautiful Western Lake District at Westwood - The B&B with a view. 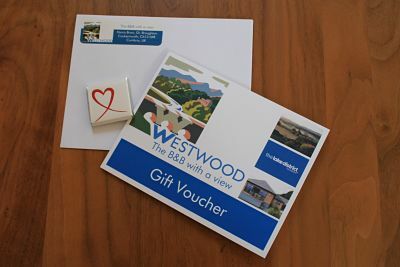 A gift voucher - made out for for as many days or the amount you wish to give, comes complete with an attractive introduction to our gem B&B and a sweet surprise, too, and all in a pretty package with a bow of your choice to set it off. 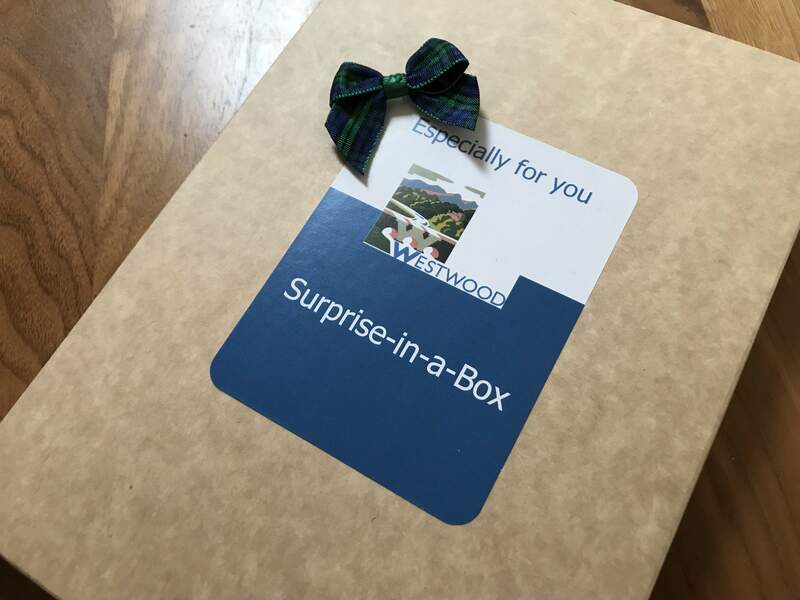 Simply give us a call on 01900 - 826474 today to order this Surprise-in-a-Box! 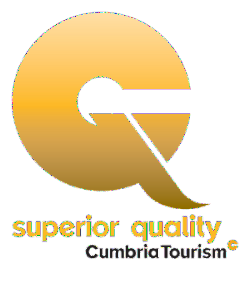 In addition to the wonderful news that we were first runner up in the B&B of the Year Award we also received the news that Cumbria Tourism had awarded us the Superior Quality Award. Today we received the logo and are very proud to now share this on our website. What an incredible evening we had! Brilliant sunshine and magical Cumbrian scenery on the way to Cartmel, travelling down an almost empty M6. Then, a huge marquee seething with over 400 excited people in evening dress, dinner suits, black ties and a few kilts, too, all having a wonderful time sipping prosecco and chatting animatedly - what an atmosphere! Beautifully decorated tables with twinkling lights - just being able to take part in this event in our first year as a B&B was an honour in itself ! Then we had the pleasure of sharing a table with the lovely people from the Wedding Venue " Broadoaks Country House" - Winners of their event, by the way, - and Smooth Radio Lake District, and, to top it all, it just happened to be Peter's birthday as well! For us to come second in the whole of Cumbria in the B&B of the Year Award is not anything we would have dreamed of when we opened our doors at the end of August last year. We are so grateful to the visitor who nominated and thus encouraged us to even apply - thank you unknown visitor! We are also grateful to CT and the Sponsors (The Cumberland) for making such an event possible and creating such a tremendous evening and, of course, we have already congratulated Raise View from Grasmere on winning and we wish them all the luck in the world when they go on to represent this wonderful county of Cumbria in the national competition next year. Our wonderful logo hit the mark right from the beginning, as guests can admire the lovely old bridge that is part of our view, and then remember it through our logo - and all thanks to Alan Roper's skills as an artist and graphic designer. 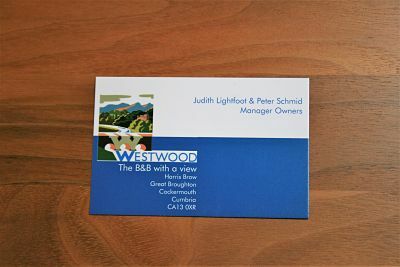 We started our "B&B Life" with an elegant white business card, with Alan's fantastic logo design, but we always wanted to combine the retro style of the logo with the modern aspects of our home such as the two-tone cladding. We do hope you approve! 18.04.2018 "Finalists revealed for ‘Oscars’ of Cumbria’s £2.72 billion tourism industry" it says on the Cumbria Tourism Website - and 'Westwood - The B&B with a view' is one of these finalists! 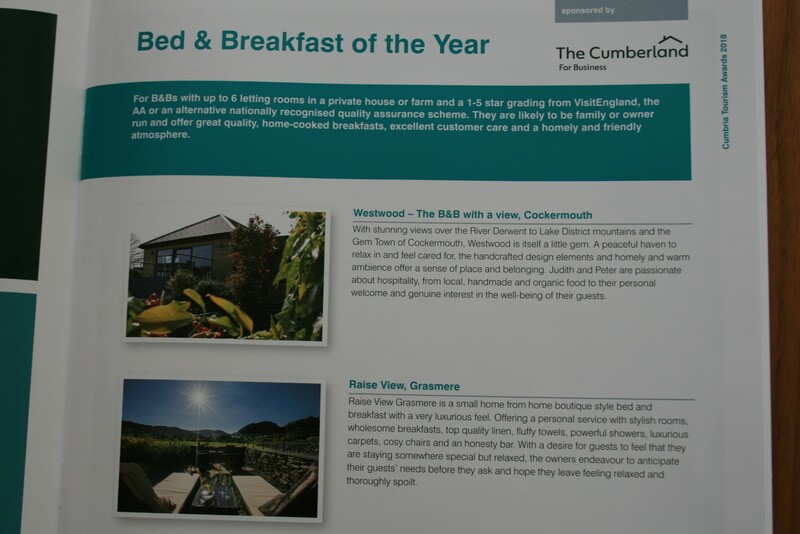 What fantastic news for us to share with you that we are finalists in the Bed and Breakfast of the Year Award! We are delighted, especially as this comes so soon after opening our doors to guests in August 2017 and we are full of thanks for this wonderful opportunity. Congratulations also to all other finalists in the awards! We would like thank the anonymous person(s) who nominated us and spurred us on to enter, and thank you, indeed, to all our guests who have encouraged us and appreciated what we are doing and given such wonderful feedback. 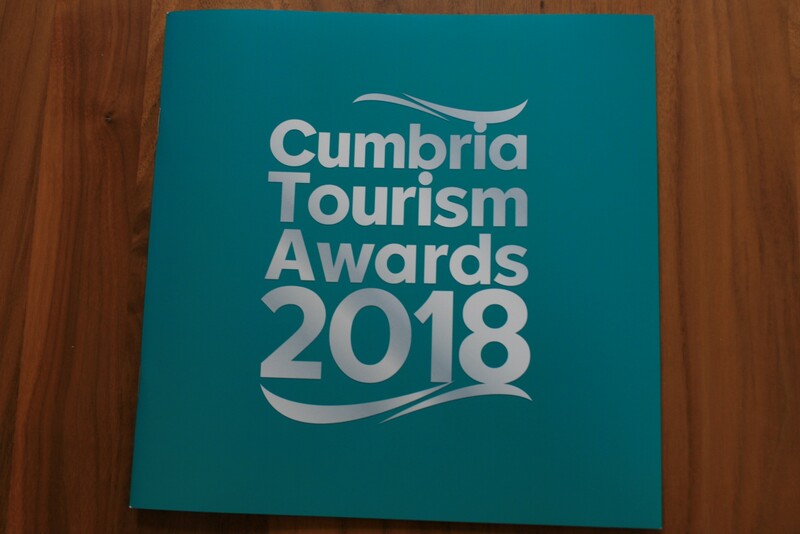 Thank you also to Cumbria Tourism and all the sponsors who make such an event possible (in our category this is The Cumberland). Not to forget a huge thank you to the independent panel of tourism experts who invest so much of their time to read and judge all the entries. We now look forward to the awards ceremony in Cartmel in June.